My wife Bobbie and I wanted to have a special "getaway" to celebrate our 45th anniversary on Oct. 13. We decided to fly out east to visit my family in sunny Florida. Landing in Atlanta, we stayed with my younger brother for a few days, and then with our rental car drove down to the Tampa/Clearwater area on the Gulf Coast to visit my older brother. Only one problem. We didn't plan for Hurricane Michael. As Michael was hammering the Panhandle, we "made a run for it" and headed south out of Atlanta, hoping to dance around the outer edge of the storm. We did. We drove through heavy bands of rain and wind a few times; however, when we arrived in Clearwater, the weather was great. By then, Michael had churned up the Panhandle and then made a turn right through where we had driven. We passed many "caravans" of tree-trimming trucks and power line trucks as they headed straight to where the storm would hit. Like many first responders, they headed into the storm as others ran away. God bless them! While watching the news of the devastation of Mexico Beach, Fla., my brother was also trying to get information about their second home: a beach house in Panacea, an hour's drive east of Mexico Beach. Was it still there? After a long day, he finally received a call from his son: Yes, the beach house was there — but heavily damaged. Their beautiful long pier was gone. Totally. The waves crashed through the doors and flooded the house with water. But the concrete walls, windows and roof were intact. Everything inside was ruined. 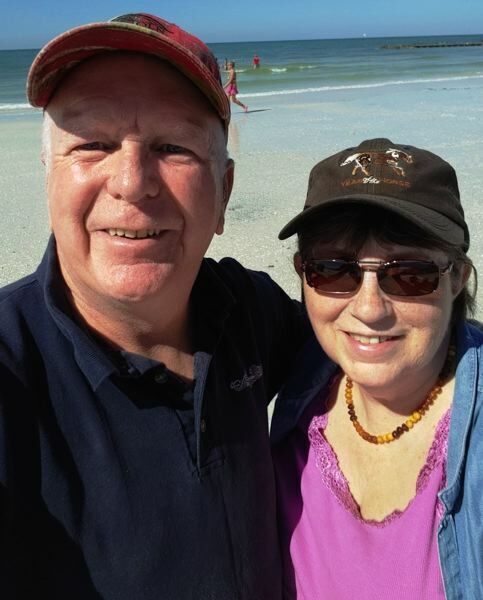 On Saturday, Oct. 13, Bobbie and I celebrated our 45 years together by hanging out on a beautiful white sandy beach aptly named "Honeymoon Island." The sky was blue and the Gulf water was warm. This old retired sailor swam out past the breaking surf to enjoy the clear saltwater. It was good for these old bones. And I have to tell you that it was, in some sense, surreal. Here I was enjoying God's great creation, yet just a few hours to the west, many other Floridians were just beginning to pick up the pieces, including my brother's family. On the flight back to Portland, I had time to think about our "dance with Michael." I have always been a student of human nature — how strong and resilient the human being is. And yet, how life can also be very delicate. Ironic. These past weeks served to remind me that relationships — even 45-year-long ones — can be resilient and long-lasting. But it takes work, commitment and dedication to make them survive. And it will be the storms of life that will test the glue that holds us all together. But in the end, we can endure and enjoy the sand and sunshine of life. Now that is something to think about! Tom Cook is a volunteer chaplain with the Forest Grove Police Department and Forest Grove Fire & Rescue.